What do I do next? That is the question that a lot of new note investors ask themselves somewhere along the process of completing their first project. Well, Brett Burky, co-founder of Paperstac, is on our podcast today to show you how Paperstac will not only improve your current working model but they will also save you hundreds of hours of back and forth with agents and lawyers as you close the deal. 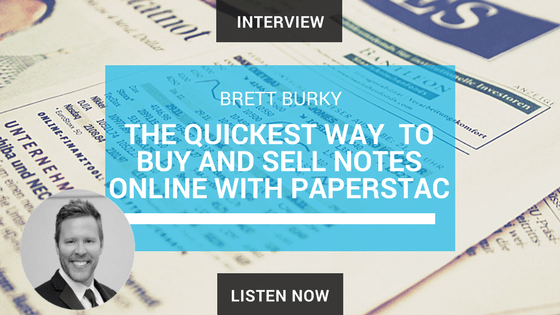 On today’s podcast Brett will be talking to us about the origins of Paperstac, how he got into the business of mortgage notes and how Paperstac can help accelerate your buying and selling process. Paperstac is a hassle-free marketplace that helps you efficiently buy and sell notes online. They have created an easy to follow step-by-step system that will guide you through each phase of the transaction. Brecht Palombo: My name is Brecht Palombo and welcome back to another episode in the distressedpro.com professional podcast series. Today I’m really happy to have Brett Burky on. Brett is a co-founder, and he’s in charge of business development at Paperstac, which is a new note trading platform and so I wanted to have him on here to share with us where this platform is going and how you can use it in your business. With that, Brett, thank you so much for agreeing to be here today. Brett Burky: Well thank you for having me, appreciate it. Brecht Palombo: So I’m hoping what we can do today is dive into Paperstac. I forget how I found you, but do you guys have just one of the most gorgeous, modern sites in this whole space. I really think it looks great. I know that you’ve been working really hard to grow it over the last … How long have you been working on it? Brett Burky: Well first off I’m blushing because that’s a great compliment, appreciate that very much. Well, see it’s been in … The origin started in 2014. Really just running into my business partner, current business partner, Rick at the grocery store, but we launched officially in 2017. We tried something where we outsourced it, and that just did not go right. We scrapped the entire thing. That was, you know, tens of thousands of dollars down the drain. We’re doing it where it was outsourced we’re always talking across the world, so I was up, at like, the weirdest hours, and, once we had it launched we’re like this is not what we want this is not what … We rebranded everything. And that’s when Paperstac was born, in really 2015, June 2015. Brecht Palombo: Cool. So tell me a little bit about how you arrived at building this company and this platform. Brett Burky: Sure, so, my business partners Rick and TJ, they’ve been in real estate for over 15 years. They started as wholesalers, and they worked that world for a long time and then, they started to see the market change. This is back in 2012, when things were getting a little tougher to do and somebody came to them with the opportunity of purchasing a mortgage note. And they didn’t really know much about mortgage notes, they heard about. But they got such a great deal they bought it for eight-thousand, and I think they sold it for thirty-thousand, within like two weeks. Brecht Palombo: That’s not that bad, I’ll take that. Brett Burky: That’s a pretty good return. So they did that for a little bit and, they were really just playing the route of real estate investor, where they would take it and get the real estate back and try to either, you know, like flip it or turn it into a rental. They were having success with it because they found this little area where other people hadn’t found. And they went and formally got educated and then really dove deep into it, and that’s what they pivoted into. And so at that point, they realized they had one … A couple major scares where somethings were, just like it’s very wild west for them, in terms of they had wired a large sum of money and they didn’t know if, they didn’t hear from the guy and they were getting pretty worried. And they were doing other things where they, they just didn’t know the process as well. They just thought this is a great investment class I wish there was a better way to do this. And there are other platforms out there, and they were doing it on there and they really liked it but they’re like, we can do something a little bit different and use a little more, focus more on the technology and see what we can create there. Brecht Palombo: That really does sum up a lot of folks first run experience with notes because it is the wild west out there. It’s not like residential investments where … That’s a very defined process. How the homes change hands, and what happens along the way, and who can sell them, and you can’t, and who gets compensated for it, and all that. Not so, in notes, and so I’ve heard more than a few stories of folks ending up in a place where they run in headlong without really vetting their sellers, or they end up in a place where they’ve wired off some money and they’re wondering what happens next. And that can be a scary place to be depending on how big that wire is, right? Brett Burky: Yeah, that wire was in the hundreds of thousands and it was family and friends money. So they were pretty scared because this is family and friends and their … They said it was like two weeks of just sleepless nights. Brett Burky: The guy had said, “I’ll put it in Box”, and they thought he meant Dropbox and … No, but there’s a company called Box.com and everything was just really screwed up and the deal ended up working out fine but it was just a process where they were just like, “Oh my gosh that was scary”. Brett Burky: Yeah. Well, we had been friends in college. And so, I was just at the grocery store and Rick was there, and I saw him … I also knew he was in real estate and we had done some … I was going to do some work for him previously when he was a wholesaler doing like SCO’s, marketing, stuff like that, he’s like, “Why don’t you come in and see what we’ve got? See if you can maybe consult for us or do something”, and I was like oh okay cool. So I went over to their office, then I heard about the opportunity and what they were trying to do, and I said, “Well okay I’m going to go back and kind of research this market”. And I went back and I was like, oh my gosh, this is huge. There’s a whole … There’s a problem here that needs solving. And I was like, this is what I’ve been looking for. I’d really been trying to find something where it wasn’t consulting work, I was getting tired of doing stuff like that because it’s always just like a round robin, you get one client … And especially in marketing, you make them successful and then you work yourself out of a job. Brett Burky: So I was like, I need to fix this somehow. So when I came back the next day, I said look, I don’t want to consult, I want in. I was like, I want to be your partners and so they said, “okay”, and so then from there, we started doing some stuff. And then it was later that we got a developer that was … He’s just a ninja, he’s just really good. Because we try to have a couple people … We went to go try to pitch different developers at investment startup conferences and stuff like that … startup meetups, not conferences. But, we just couldn’t find the right guy. We interviewed a bunch of people and you just want to make the team mesh. It’s got to be a tight knit. And so it was like … Rick’s like, “This guy named Mike, he designed a website for us back in 2009”, and I was like let me see it. So I looked at it, I was like, this guy’s using … this is 2009? I understand a lot of code, the different type of code that he was using at that time, I was like, this is very forward for 2009. A lot of jQuery, we’re not going to go that route, but it was good. So I was like, wow this guy is really good. So then I reached out to him and basically the story goes, is I guess I … My enthusiasm sold him on the opportunity and we’ve just been knee deep in it ever since. We’re just been at that point. We didn’t realize how big this is. So there’s one thing where you have it where you list the properties. The listings can be done, but the whole process from everything from negotiations to signing all the documents, having an online notary pop up on your screen, closing, sending the collateral files, wiring money, doing it all digitally where you can do it from pretty much your phone? It’s a big thing. And so it’s one of those funny things where friends would always say, “Are you still working on that? Is it not done yet?”, and I’m like yeah it’s not exactly just an ecommerce store. People don’t just go there and click one button and buy a note, it’s a lengthy process, it’s a put it into a system, it’s just a … Some of those ideas of how do you do it to a way where it’s not tedious. The whole goal was for us to not give people more work. This has to be something that it’s not … People are already doing business the way they do business and what we need to do is make it easier or it’s not an option. Why would they do it on Paperstac if they can do it just as well in a different manner? So the goal had to be that it has to be ten times better, ten times faster, and ten times safer, than what’s going on. So that’s what we’ve been shooting for and that’s been our goal the entire time. So far we’ve done pretty good with it. It’s sort of being launched in September, we went to an event out on your side of the country, out at IMN, which is out in … I think the island was Dana Point. It was really, really … Dana Point is gorgeous. So that was what we officially launched and then we started having transactions, I think that was last September. So October things started to go and then had a couple more November, things sort of slowed down for December. We’ve since then just had tons of feedback. So tons of people saying, “Wow, this is great. I love it. I wish it did this”. So it’s one of those things where we really listen. So it’s like, okay it needs to be able to take pools, people need to be able to use their own documents, just all these features and to the point where I actually went to our data base and I called people on the phone, sent them personal emails, come complain to me, what would you like to see? And so we have meetings and we’ll run those things and see which of the most common things that people want. And so, we’re calling version one, which is going to be out next month, is everything that was asked for so far and a bit more. So, that’s where we’re currently at. Brecht Palombo: So tell me a little bit about who your target customer is with this. Is it hedge funds? Are you targeting banks? Are you looking at private investors? Who’s using your platform? Or who do you intend to have use your platform? Brett Burky: That’s a good question. I mean, currently what we’ve had is we decided that we needed to focus on the current note investors. But there’s a lot of people that we’ve seen going to different conferences where people … They might have been in the industry for a little bit of time and they just haven’t pulled the trigger on anything. And we were kind of like, what’s holding you back? What is it, if the note meets your buying criteria, what is it? So we’re trying to get to the regular everyday note investor that is managing these things, maybe they just have a small fund and there’s just ten, fifteen assets, to people that are managing hundreds of them. Our main goal is to focus on the current note investor and provide a solution for them. Brecht Palombo: As opposed to expiring you mean? Brett Burky: Yeah. The second weight would be more like … So real estate investors seeing this as an option but just not knowing how to go through the process. Later when I demo the thing you’ll see it’s basically … We’ve had people, not to say my parents couldn’t buy a note, but it’s just the process makes it so simple that pretty much someone that’s not familiar with it, just go through the steps. If you just check the steps and you do everything right, you’re not going to get hung up on something where you accidentally do something wrong. The problems where people … There’s things that go, “Well what happens then? What happens then?” you don’t have to guess. It’s just like, just go to the next step. So we’re starting with the current note investors and that’s where we wanted to get the best feedback cause we’re basically dogfooding this product because Rick and TJ are active investors with a multi-million dollar fund, and so when we say, “Hey what about this?” they say, “Well it should be done this way. It would make it a lot easier”, okay. So we do it that way instead. And then with other note investors like, “I really wish it did this”, so if we make it good for the people that are currently in the trenches daily, the other people that would come in, which would be the second wave, would be more real estate investors, maybe … We call them stock market refugees, people that are sitting on the side-lines kind of scared of the markets, looking for a safe investment with a good yield, maybe like an RPO. This might be a better avenue for them and if we make it safe and easy for them, then we’re hoping that there’s a likelihood that they’d say, “I can do this. I can do this with this software, it seems easy enough to do”. Brecht Palombo: So it sounds like the big difference for you guys and what you’re focusing on is kind of two-fold, and correct me if I’m wrong but, for one thing, sounds like you’re talking about really having it be pretty comprehensive in terms of how you manage the transaction, right? Did I get that right? Or would you agree? Brett Burky: Yeah. Yeah, we’re trying to cover all the bases. So there’s things like right now when you get people to the end of the transaction, it’s like, “Would you like us to record the mortgage for you? Or do you want a mortgage recording done?” oh yeah, I do. So it’s just another thing they can click and then we do it. So it’s things that people might not have done. Did you know you need … who are you servicing with? I don’t know, who am I supposed to service with? Well, there’s options out there. We’re not going to tell you who to service with cause there’s a lot of great ones and we don’t want to be biased to any of them, but to say you need it with a servicer is probably pretty important. Kind of hard to do it by yourself. So people sometimes think that the newer people might not know … Maybe forced-placed insurance, hazard insurance, stuff like that they probably want to get they just … Those are the things we’re trying to do. And some of the things in the system are going to be automated for people and sometimes, currently, it just kind of … We have an internal chat where we’re kind of watching … Not watching, but at the end of the transaction, you can see, okay this has been sent. This has been done. So then a lot of the times I’ll reach out to the buyer, is there anything else we can help you with to make this easy for you? And if they have questions at that point like, well what’s the next best step? Well here’s some suggestions. We can’t give investment advice because that’s not what we are but we can say, look, most people will service their note. That’s important. And most people will get this,this, this, and this. So we don’t provide those services, we just want to make sure that they have a happy service with Paperstac and realize that, oh wow, they’re actually trying to help me once this is even done. Brecht Palombo: Yeah, so tell me about the seller side because a lot of folks who are using our platform are out there digging up deals, you know that’s really what our software is all about, and all our training is being able to go out there and actually find the deals. What’re your rules or who makes a good seller customer or client for you? Brett Burky: Well anybody who’s managing their portfolio that’s a seller that has notes they want to get rid of we are doing an integration into servicers, so usually we want to be able to get the most up to date information. So just any seller that’s … We also say, or at least Rick and TJ always say there’s a for sale sign always in the front yard. So if people want to sell their assets and they want to put it on something where they can manage it, that’s what it’s for. We see a lot of synergies with you guys here where they can find them through your software Distress Pro and then be able to, maybe if they find one, maybe turn an R into RPL, or if they want to get rid of it as a non performing, they can put it on the Paperstac. We want to eventually scale to where we can take on a lot of people, but we want to make sure in the beginning we have the right people so that the reputation stays pure. And so a lot of these people have been met at different conferences, phone calls, private Facebook groups where we know that these people are active. We know that they’re not somebody that’s going to come on and, not anything against most brokers, but some people can do some bad stuff and waste people’s time and we’re trying to not have that happen because that would really reflect badly on us cause then they can say, “Oh well it’s just filled with a bunch of brokers”, well that’s not what we want. Brecht Palombo: You’re much nicer about that than I am. Business is full of the joker broker, I mean it’s an inexcusable sort of thing where they’re … Maybe they know a guy who knows a guy, who knows a gal, who knows the seller, who had the tape a year or two ago. I’ve had friends who’ve had their own notes in this business shopped back to them where someone who knows a guy … But then comes the, “Hey you want to buy these?”, no I’m selling those notes, you idiot. So it’s definitely … and I think part of that comes with the territory of it being the wild west. I mean, on the one hand, that’s one of the reasons why it can be so profitable is that it is the wild west and so we don’t have all that stuff that we have to deal with when we’re talking about single-family residences, or whatever. But on the other hand it does make for a bunch of chumps out there who don’t have any product and that’s the last thing you want to do is get folks involved with going down the road of due diligence only to discover that they’re not really talking to anyone whose authorized to sell the thing. Yeah, so that’s definitely a huge problem in this industry and I like to see that you guys are taking a stand on that. Brett Burky: Yeah we try to address that the best way we know how cause Rick and TJ have a lot of their assets on the platform. We have other sales on there too, but we’ll get a lot of bids and we’re doing a lot of things in the new system to where you’re going to have a rating score. So it’s going to be a rating score where sellers can say things that say, “Hey this person wasted my time”, or something like that. We’re starting to see people christmas-treeing the site, putting up 50 bids within 30 minutes, which is not feasible. How would you know without doing any … Bring up the due diligence to know that this is the right asset for you. We’re putting those things into place because we want to make it so that Both sides are very important. Building a platform is extremely hard. This is the hardest marketing thing I’ve ever tried to do. I’ve done a lot of other stuff and building a platform, I didn’t know what I was getting into cause you have two different markets. You have the buyers and you have the sellers and you’ve got to make sure you cater to both. But it’s kind of the chicken and egg because if you don’t have one you don’t have the other so. Right now my focus is a lot on sellers because we want to make sure that it works for them cause their time is valuable … You know so is buyers, we value their time as well. But we want to make sure that if a seller’s willing to put their assets on there the bids that their getting are not wasting their time bids, bids that are just not realistic and they’re bids that don’t get held up in what we’ve seen, I’ve got to check my legal department. What legal department? And then we’re like, you’re shopping this around aren’t you? So you got it for this and now you’re checking with your legal department? That’s a first. So different things like that and then the new system we have it where sellers can basically have a private community where they don’t want to accept you if you haven’t met these criteria. You can’t get in. So we’re trying to do some things where it’ll basically be exclusive. It’ll be exclusive in that it’ll answer some questions … We have a list that we’re trying to whittle down, it’ll basically make it so that these people are people that you’d like to do business with. And it’s not saying that you don’t know this guy, that you might see him at every conference, the reason why you’re using Paperstac is that the transaction process is a lot faster. So it’s more of an efficiency tool at that point and not a platform for finding new buyers. It’s more this is an efficient way of doing it, and I can fly through these things a lot faster, selling pools, whatever. So that’s what we’re trying to do. We want to kind of make it for all, cause we go to these conferences, and we’ll meet some, and we want to be inclusive. So we were trying to figure out the best way to include everybody and not exclude everybody but make everyone happy. And I’ll tell you what man, it’s a math problem. But it’s a fun one, and we’re really close to solving it in the way that we see will work. And it’s coming next month. Brecht Palombo: Well that’s cool. So, I’ve got a couple of things that I … And I don’t want to blindside you here, but I see if you go right to your site, you’re very transparent about your pricing. Pay $250 plus a half a percent of the sale price when you close a deal. Is that something you’re taking forward with … In your new version? Brett Burky: We’re changing the pricing because it’s kind of confusing. People are like, $250 plus a half a percent, it makes you think, and some people are like, “I thought it was 5%”, no, no, no, it’s not 5%. So really the $250 is a lot of the hard costs, so there’s a lot of hard costs that we put into it such as, we pay for your third-party auditing … So we have a third-party auditor that will view the collateral and make sure that it is what the seller says it is, we pay for first class shipping labels back and forth, we pay for the notarization process, and then we have the upkeep of staff. So, that really wraps in … That $250 is basically just a wash. It’s basically just to cover the cost to get the transaction done. And so at that point it’s … We’ve gone back and forth but I think it’s 1%. So it’s … Gosh, don’t quote me on that because we just recently changed that in the last meeting. But it has to be something that … And that’s one thing that we’ve been going back and forth on too because we have some assets that are lower priced, and it’s like, well is it 1% if the assets $1000? What do you do with this when you have some guys selling a million dollar asset, okay well is it 1%? So there’s a lot of things that were trying to take into effect. Especially, also too, if a broker puts together a deal, and they’re taking, whatever points or something like that, where they’re making 1%, now they’re adding … So that’s still in the works. We’re trying to make it so that it’s … Really our goal is to make sure that you’re getting the value and the price is justified cause we don’t want people to say, “Well I love it but it’s expensive”, because that’s the last thing that we want. We want people are like, “This is saving me hours of time, it’s worth the price”. So we’re getting rid of the $250 and we’re just going to throw it into one thing so that it’s easier to understand cause it has been something people have just … If you go to the web server right now, actually I shut down my chrome so nothing popped up, but if you hit that little thing in the corner, that’s my face, and I get that question quite often. And so, as well we got to nip that in the bud. Brecht Palombo: Well I’ll tell ya, in this business I’ve made anything from 10% to as low as three-quarters of a point in terms of commissions, depending on the size of the deal usually. So 10% down in a couple hundred thousand dollar type deal and then 3/4’s of a point on like, ten to twenty plus million dollar kind of transactions and so I don’t know how that translates to what you’re doing here, especially … That’s like a full-service sort of a thing. But it makes sense that you’ll sort out your commissions or your fees or whatever as you go forward and you start seeing what kind of deals are going through there. I guess what I was going to ask you here, where I was going to blindside you additionally was, have you got a deal that you can offer our listeners? Brett Burky: Oh yeah. We’ve got a … Yeah, I’ve got ten deals that we just got all the ONE’s and BPO’s back from. We’ve got a mixed bag, so I don’t currently have a … I’m waiting from … So what we’re trying to do is write the story for each deal because we found that it sells better that way. If people can’t see … What’s the exit on this? We had it where … We had over a hundred assets on the site at one time and we found people just wouldn’t … It’s almost too much. It’s almost too much where they’re like, “Well I don’t know which one”, and it was … If they didn’t know what they were looking for because of the way it’s listed, it’s in like a … You see, they’re all listed right there, it’s not in a spreadsheet format so it’s hard to run your calculations on everything, which is also changing in the new one where you’ll be able to see it like a … You can run your calculations on whatever your exit strategy is. A lot easier but, we had to start putting these assets out and just like, ten at a time, mixed bag, some non-performers, some re-performers, different states, different strategies, and then write the stories, and then put them out by email so that people can say, “That’s the one I want”. But yes we do. All that long-winded to say I have ten and after we finish here I can get the story and I can send it over, and they’re all great. A lot of them are … They’re all Midwest, Ohio, Illinois, Indiana, Michigan, those areas. But they’re some of the best ones that we think that would sell the fastest. Brecht Palombo: Well here’s what I’d love to do it, it’s one thing for you and I to get on here and sort of talk about this whole other thing, if people can’t see it. What I’d invite people to do now, and what I’d love to do with you is we’ll jump off here and get on recording a quick demo that people can find for this episode. It’s going to be at distressedpro.com/paperstac so just drop the ‘K’ and otherwise just like you would expect it. So distressedpro.com/paperstac and over there what we’re going to have is a demo, a little walk through where we’re going to show you the site and some of the features behind it, and maybe, of course depending on when you see this, any of the deals that are on there may or may not still be available, probably not, but there’ll be other deals there for ya. So I’d encourage you to do that go to distresspro.com/paperstac. P-A-P-E-R-S-T-A-C, and there you’re going to be able to see a full demo, and you’ll be able to get a transcript to the show, and Brett, does that sound good to you? Brett Burky: That sounds awesome. That’s great. Brecht Palombo: Well cool, I appreciate you coming on here. Folks if you’re driving you just want to remember one thing, you can go to paperstac.com and check this out. Again, P-A-P-E-R-S-T-A-C.com. Today I’ve been speaking with Brett Burky and if you come on over to distresspro.com/paperstac we’re going to show you a demo so you can see exactly how this thing works. So thanks so much for listening to another episode of distresspro.com professional podcast series. Thanks Brett. Thank you Brecht. Great topic. Very usual information as always. I have learned a lot. Thanks again.